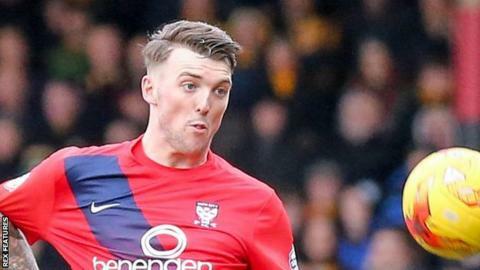 Hartlepool United sealed three points against 10-man York City, who stand on the brink of relegation from the Football League in League Two. Nathan Thomas tapped in to put Pools in front before the Minstermen had Dave Winfield send off for a second yellow. Kyle Cameron restored parity and got the visitors back in it as he headed Luke Summerfield's corner home. At the other end, Michael Woods ensured victory for the hosts as he rose to nod home Carl Magnay's delivery. The result means York remain 23rd in the table and are nine points adrift of safety with four games left to play. Hartlepool, who were one place off the relegation places in 22nd when manager Craig Hignett was appointed in February, remain in 16th place. "I think first half we didn't hold the ball well enough to start with. I think at certain times we made things difficult for ourselves. "I thought we played better at times when we were down to 10 men. The ball was sticking more in the final third. "But playing for so long is always difficult, especially away from home." Match ends, Hartlepool United 2, York City 1. Second Half ends, Hartlepool United 2, York City 1. Attempt blocked. Lewis Alessandra (York City) right footed shot from outside the box is blocked. Corner, York City. Conceded by Matthew Bates. Attempt missed. Luke Summerfield (York City) right footed shot from more than 35 yards misses to the right. Corner, York City. Conceded by Lewis Hawkins. Corner, Hartlepool United. Conceded by Scot Bennett. Substitution, Hartlepool United. Jack Blackford replaces Michael Duckworth. Corner, Hartlepool United. Conceded by Scott Flinders. Attempt saved. Luke James (Hartlepool United) right footed shot from outside the box is saved in the top left corner. Attempt missed. Michael Woods (Hartlepool United) right footed shot from outside the box is just a bit too high. Attempt saved. Michael Duckworth (Hartlepool United) right footed shot from the centre of the box is saved in the centre of the goal. Lewis Hawkins (Hartlepool United) wins a free kick on the right wing. Substitution, Hartlepool United. Jordan Richards replaces Jake Carroll. Substitution, York City. Daniel Galbraith replaces Matt Dixon. Attempt saved. Luke Hendrie (York City) left footed shot from the centre of the box is saved in the centre of the goal. Goal! Hartlepool United 2, York City 1. Michael Woods (Hartlepool United) header from very close range to the bottom left corner. Assisted by Carl Magnay. Foul by Scot Bennett (York City). Attempt saved. Luke James (Hartlepool United) right footed shot from the centre of the box is saved in the centre of the goal. Attempt saved. Luke James (Hartlepool United) right footed shot from outside the box is saved in the bottom right corner. Attempt missed. Luke James (Hartlepool United) header from very close range is close, but misses to the left. Attempt saved. Michael Woods (Hartlepool United) right footed shot from a difficult angle on the right is saved in the bottom right corner. Corner, York City. Conceded by Carl Magnay. Corner, York City. Conceded by Jake Carroll. Corner, Hartlepool United. Conceded by Kyle Cameron. Second Half begins Hartlepool United 1, York City 1. First Half ends, Hartlepool United 1, York City 1. Goal! Hartlepool United 1, York City 1. Kyle Cameron (York City) header from the centre of the box to the top left corner.